After launching a MyStyle site with hockey accessories like necklaces and bracelets late last year, PuckStyle has now released custom hockey pucks that you can design online. The hockey pucks on PuckStyle are custom printed in full color with the customer’s design. The customer is able to use the MyStyle Customizer to design the custom puck with their own images, logos, text, monograms, colors, patterns, effects, and more. 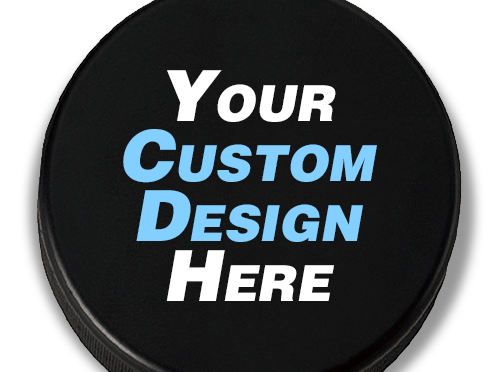 We’ve made what is probably the most advanced custom hockey puck designer on the web! The custom puck is a two-sided product that can be chosen to have either a 1 or 2 sided print. When a user is on the product detail page, they can choose whether they would like a 1 or 2 sided print on the puck. While in the customizer, you can design both sides, or just one side and leave the other side blank. Once in the shopping cart, the product option for 1 or 2 sides can be changed for any last minute up-sells to 2 sides. Want to give PuckStyle a try? Head on over to the site and design your own hockey puck!